Yesterday was the final day of the Connecticut Maritime Association Shipping 2009 Conference and Exhibition. Amver found the entire event packed with just the right mix of people to call our participation an unbridled success. The highlight of the CMA Shipping exhibition is always the Gala Dinner and Shipping 2009 did not disappoint. In a fashion reminiscent of the passing of U.S. Presidential powers, the succession of duties of CMA Commodore passed peacefully from John Fredriksen, of Frontline, to Captain Wei Jiafu, of COSCO. Amver was excited to have an opportunity to thank Captain Wei for COSCO's participation in Amver and encourage him to have the entire COSCO fleet actively enrolled and participating in Amver. Finally, Amver would like to thank everyone that stopped by the booth to say hello, congratulate us on our Plimsoll award, or just see what's new in the world of search and rescue. 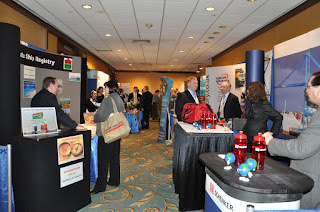 We look forward to seeing you at Shipping 2010! What is your favorite part of Shipping 2009? Have you seen USCG Rear Admiral James Watson's video blog yet? Check out one of his installments here. Another edition of Welcome Wednesday is upon us! Let's welcome the latest members of the Amver family. There are 21 new members from the previous week. These vessels are dedicate to ensuring no call for help goes unanswered. Thank you for enrolling in Amver. While we hope you are never called upon to assist, the oceans are safer because of your participation. Do you work with any of these vessels? Leave us a comment! Excitement filled the air as day two of the Connecticut Maritime Association's Shipping 2009 started. Besides a full schedule of conferences on topics such as piracy, the luncheon included awards sponsored by Professional Mariner Magazine. The Amver staff was busy talking to all sorts of visitors including former participants and international maritime students. There were even some students from the Shanghai Maritime Academy! The highlight of the day was the presentation of the Professional Mariner Plimsoll Award for Outstanding Service to Amver. We were humbled and honored to receive this prestigious award on behalf of the United States Coast Guard and the thousands of Amver participants that make the system work. Several new leads developed from meeting the array of delegates at Shipping 2009. Another fleet management company is interested in a possible partnership to increase Amver reporting and the Indian Coast Guard is interested in expanding their regional ship reporting system on the Amver model. 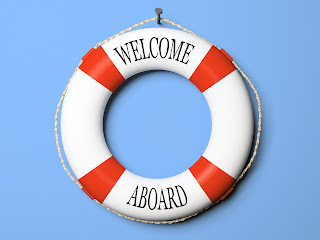 Tomorrow brings more opportunities to interact with our shipping partners and welcome COSCO President Captain Wei Jiafu as the new Connecticut Maritime Association Commodore. Stop by and see us in booth G-104 or follow us on Twitter to learn what is happening. Today kicked off the 24th annual Connecticut Maritime Association Shipping conference and exhibition in Stamford, CT. With over 1,800 registered delegates this is the largest expo CMA has hosted to date! The day started out with the Women's International Shipping and Trade Association luncheon and some industry meetings including a meeting by INTERTANKO. The keynote address was given by a distinguished panel including United States Coast Guard Vice Commandant Vivien Crea and Congressman Elijah Cummings, Chairman of the Subcommittee on Coast Guard and Maritime Transportation. Both Admiral Crea and Congressman Cummings addressed issue relating to the U.S. maritime sector. Admiral Crea announced a recent BIMCO informal survey supports the Coast Guard's efforts to treat seafarers more professionally during boardings and inspections while Congressman Cummings spoke about short sea shipping initiatives and piracy. Tomorrow features additional sessions such as piracy, the world economy, a granular look at major shipping sectors, and dealing with a distressed market. The highlight of Tuesday will be the luncheon where the Professional Mariner Plimsoll Awards will be presented. Amver will continuing blogging and Twittering the news from CMA. Stop by and see us in booth G-104 and say hello! Amver has spent the last two days at the Emergency Prevention, Preparedness and Response working group of the Arctic Council in, of all places, Las Vegas, Nevada. While you may wonder why an Arctic working group is meeting in Las Vegas I think I can shed some light on our meeting venue. The working group meeting, hosted by the United States, was coordinated by the Department of Energy National Nuclear Security Administration. Our meetings were held at the Atomic Test Museum, and the Nellis Air Force Base Remote Sensing Laboratory. The radiological component was well suited for our venue in Nevada and we were treated to a tour of the Nevada Test Site. The Arctic remains vulnerable to radiological incidents, among other hazards. Delegations from Norway, Russia, Canada, Finland, Denmark, Sweden, and the United States discussed the various topics affecting the Arctic. At the conclusion of our meeting the United States was unanimously elected chair of the working group. The Arctic remains important to shipping and the Arctic nations are committed to ensuring the Arctic is safe for residents, mariners, and the environment. Do you think Amver can play a significant role in Arctic search and rescue? What are your concerns for the Arctic? 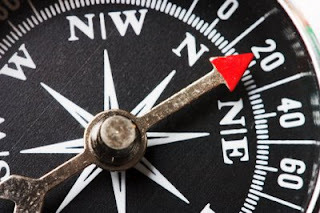 We are going to try a new feature here at the Amver blog. In years past new Amver participants were always listed in the Amver Bulletin. From now on these new participants will be listed each Wednesday in our new Welcome Wednesday feature. These will be the ships that enrolled in the Amver system in the past week. So on with the welcomes! These vessels are dedicated to ensuring no call for help goes unanswered. Thank you for enrolling in Amver. While we hope you are never called upon to assist, the oceans are safer because of your participation. If you are a crew member or work shore side with any of these vessels please leave us a comment. The premier shipping event of 2009 is upon us. That's right, Connecticut Maritime Association's Shipping 2009 is being held in Stamford, CT March 23-25. Amver is exhibiting in stand G-104 and hope our friends, readers, and Coast Guard shipmates will come by and visit. 2009 poses significant challenges to the shipping community. Nobody is immune from the impact the economy has on our operations. Budgets for everything from advertising to operations are tight. Crewing, chartering, bunkers; every aspect of shipping requires us to study the charts and make wise decisions. What better opportunity to hear from the experts is there than CMA Shipping 2009? Shipping 2009 isn't just business. Don't forget about the Commodore Awards Dinner, afterglow cocktail receptions, and the usual amount of jocularity that accompanies this comprehensive conference and expo. If you can't make it to this year's event don't worry. Amver will be live blogging and tweeting from the conference. We may even try our hand at video blogging. So stay tuned to the Amver blog or follow us on Twitter for the latest from Shipping 2009. Are you coming? Let us know in the comments and we can connect! So you are a good boater and heeded the call to switch your 121.5 beacon to a more accurate 406 type EPIRB. You have read the information on how they work and have properly registered your beacon as well. Now what? Just throw the old beacon away, right? Not so fast. Just because the United States Coast Guard no longer answers 121.5 beacon activations that doesn't mean the devices are silent. In fact, many general aircraft still have 121.5 beacons on board. Who is responding to these 121.5 alerts? The Civil Air Patrol. The Civil Air Patrol has launched a campaign to alert 121.5 beacon owners on the proper way of disposing of their old beacons. Read more about proper disposal procedures here. Improperly disposed of beacons means a volunteer air crew may have to risk their lives to search for a false alarm. How do you dispose of a beacon? Dispose of the device at an approved electronic disposal facility. Register your new 406 beacon here. United States Coast Guard Sector Jacksonville Commander, Captain Paul Thomas, reunited Leo Sherman and the crew of M/V Auto Banner at a pier side ceremony Monday. Sherman was rescued by the Auto Banner in a dramatic case 180 miles off the coast of Madagascar in January. Mr. Sherman's account of the rescue can be read here. Captain Thomas, flanked by Sherman and the master of the Auto Banner, Captain Duck Jun Kim, presented an Amver pennant and certificate of merit to the crew of the Auto Banner for their efforts. Our thanks to Mr. Edward Manucy of Wilhelmsen Ship Service, Captain Kim, Mr. Sherman, and Captain Thomas for helping organize the event.